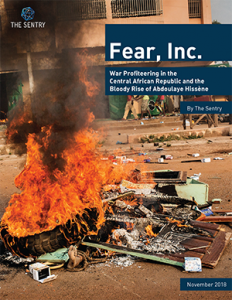 The Sentry’s latest report released today focuses on the financial drivers of the protracted crisis in the Central African Republic, and follows the path of Abdoulaye Hissène — a notorious warlord, one-time minister and businessman who has been deeply involved in the country’s conflict for almost a decade. The Sentry’s investigation reveals that Hissène has built a profitable business network from the ashes of devastating sectarian violence. By inciting hatred and sowing divisions between ethnic and religious communities, he has gradually become one of the most influential war profiteers in the CAR conflict. Acting as a “minister” and a leader of multiple armed groups, while also advertising his control of rich mining sites, Hissène has benefited from the illicit trade in diamonds and gold. Mass violence is a billion-dollar business in the Central African Republic. Unscrupulous political and economic actors, including foreigners, fuel and perpetuate warfare for personal gain. By capturing the country’s rich resources with the complicity of perpetrators of mass atrocities like Abdoulaye Hissène, these networks have sunk the people of the Central African Republic into a terrifying realm of deep injustice, crushing poverty, and overwhelming fear.” — Nathalia Dukhan, Central African Republic Researcher and Analyst at the Enough Project. Hissène’s rise illustrates the violent system endemic in CAR that incentivizes conflict over peace. War profiteers and their allies, national and foreigners, hamper peace efforts, given that conflict and state collapse are viewed as lucrative business and smart politics. It is time to change this dynamic and ensure that there is meaningful accountability for individuals like Hissène, and their networks, with consequences that can create leverage for more sustainable peace processes. The Sentry report includes recommendations intended to provide policymakers with strategies to end the incentives for violence, and ultimately encourage accountability and leverage to pave the way for a lasting peace. Click here to read the full report and recommendations. Cliquez ici pour lire le rapport. Click here to read a one-pager on the report.